When Hurricane Mitch entered Nicaragua on October 30, 1998, the population was totally unprepared. While people in other countries observed the path of the hurricane by television and radio, the Nicaraguan government had decided to not inform the population so as to avoid panic. The inhabitants of the northern mountains, without access to foreign television channels, were bothered by the first massive rains, but they had no idea that this would continue uninterrupted for three days and nights. 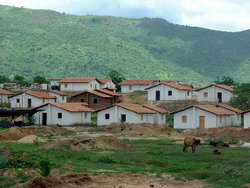 In the northern provinces of the Segovias, 7,200 houses were damaged and more than 4,000 lost, 15% of the existing houses. 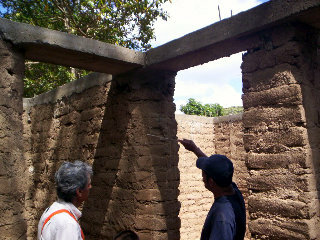 The Municipality of Ocotal suffered from severe landslides, as various neighborhoods were built in high risk areas. The local authorities took the initiative and, together with a group of professors and students from the capital city of Managua who had helped during the emergency, planned reconstruction activities. Various small Spanish NGOs contributed the funds and the municipality was able to obtain an adequate terrain on the outskirts of the town to resettle families that had lost their houses and could not return to a plot in the high risk area. An organizational structure called “Pueblos Unidos” was created and with the assistance of the professors and students a model project was elaborated. Accepting the terrain as it was with its modulations, and not wishing to flatten it as often happens in social projects, an interesting and functional neighborhood was designed. The free flow of rainwater was guaranteed, the streets were accommodated to the terrain, and the plots distributed in an organic fashion. The design of the house followed traditional patterns, and were simple, functional and presentable, creating the image of a “natural” barrio. 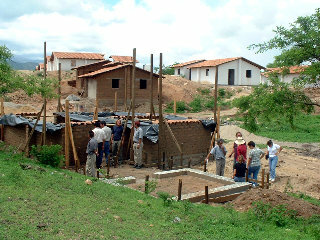 The construction was organized in small teams comprised of a mason, carpenter and two helpers, many of whom were beneficiaries. Together with these salaried teams, voluntary support brigades of beneficiaries were organized to make adobes, cleanup, excavate, and transport. The progress could not be rapid as the money arrived little by little, which had a positive effect, as the beneficiaries felt more committed through the struggle and the uncertainty, and the selection of the families could be carried out more carefully. Each family had to qualify in order to enter the list of the beneficiaries. Construction began five months after the sinister events and the 180 houses were completed within three years. 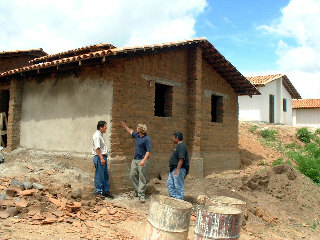 Construction of each house took an average of 37 work days and cost $US 50 per m2. This figure includes management costs, but not the multiple assistance of the municipal government in the form of municipal services and transportation. Later 120 more houses were built on neighboring terrain. Six years after termination, the neighborhood has a good appearance; many people have made improvements and additions to their houses and the community is full of life and emanates a sense of satisfaction. Without doubt it is a model project, thanks to the combination of good coordination with local authorities, a growing level of organization among the beneficiaries, and professional support. Research and investigation of materials, specifically alternative cement and cement products.